… and other stuff you do while on the road by bicycle. So even if the landscape is really nice and there is a lot to see, we sometimes do get a little bit bored, but luckily enough our brains rarely sleep and come up with some ways to keep us busy even during the most annoying parts of the journey. First of all there are of course the sheep and we have started to do some experiments on them: now if you “just cycle by” (that is withouth making any noise) they will just look at you and then keep on feeding on the juicy grass. If you however pass by them and ring your bell, they will run off immediately. It doesn’t matter if there is a huge fence or 200 meters between you and them, it’s just and impulse: “first run, ask questions later”. However, if you drive by and “baah” and “meh” like them, they will look at you in curiosity wondering what this strange sheep on wheels is, before they run off. Finally we experimented barking like a dog, which basically gives the same result as “ringing bell”. Very interesting indeed. Other animals very interesting along the road are herds of deer that actually show a lot of ressemblence to Chinese in their absence of discretion. As soon as we drive by, one will lift up its head and then as some kind of wave all heads will go up, ears too and they will even go as far as they can to the fence to have a look at us, without shame! Very curious, just like the Chinese used to do when we were in China. A third population group that manages pretty well to keep us busy are the numerous cars and trucks passing by at 2 cm (and this is independent from the fact if you are actually ON the road (which means on the right of the white line, as they drive on the left here) or OFF the road (on the left of the line). Very nice. We actually thought that in some countries in Europe it was pretty suicidal to drive a bike (we will not mention them here in order not to offend anybody…), but New-Zealand is just getting pretty close to that! Well at least it keeps our arms busy in making a well-known obscene signal from time to time (not very effective though) and it sure keeps us alert, but we are looking forward to some quieter roads soon. This entry was written by Vera and posted on April 26, 2008 at 8:45 and filed under New Zealand, World Trip. Bookmark the permalink. Follow any comments here with the RSS feed for this post. Both comments and trackbacks are currently closed. Vera, tu sais déjà parler le néerlandais, le français, l’italien, l’espagnol, le russe, le norvégien, l’islandais, le…., cela ne te suffisait pas, il a fallu que tu apprennes aussi à parler le “mouton” !!!! I am jealous, sooo jealous! A couple of minutes ago I was uploading to my Facebook album the pics of Mongolia – kindly sent by JCŽs mom. Now I am going through your webpage and…I am jealous! Many, many kisses – and some hugs – from the Emerald Island. Looool! Funny story! In our children TV we can see each Sunday (I try to miss not a single cast) ‘Shaun the sheep’. They are very human. By the way, are you aware that it would have been the best promotion for the Olympic Games when you both would have carried the Olympic torch around the world? @Jose: And you think we are not jeaulous that you are working for Google??? @Juergen: Yes you are probably right about the Chinese, but I just cannot miss on any (beautiful) occasion to make some jokes on them. 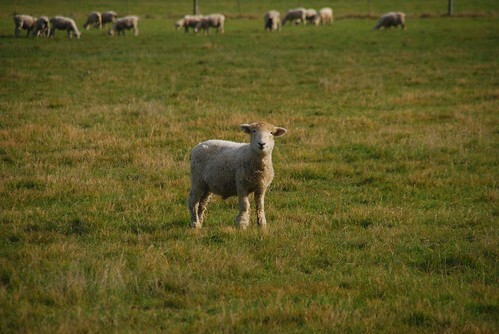 Ik krijg echt een fashback als ik jullie schaapverhaal lees. Herinner ik me nog als de dag van gisteren (ook al was ons bezoek aan het zuidereiland al in 1982! ).